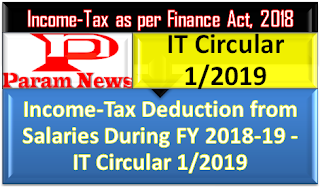 SUBJECT: INCOME - TAX DEDUCTION FROM SALARIES DURING THE FINANCIAL YEAR 2018-19 UNDER SECTION 192 OF THE INCOME- TAX ACT, 1961. Reference is invited to Circular No. 29/2017 dated 05.12.2017 whereby the rates of deduction of income - tax from the payment of income under the head "Salaries" under Section 192 of the Income-tax Act,1961 (hereinafter ̳the Act‘), during the financial year 2017-18, were intimated. 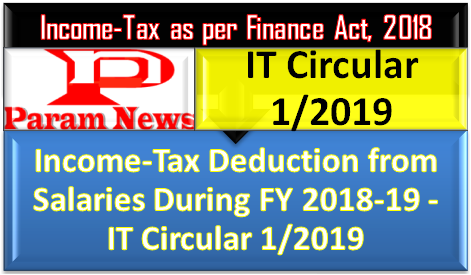 The present Circular contains the rates of deduction of income - tax from the payment of income chargeable under the head "Salaries" during the financial year 2018 -19 and explains certain related provisions of the Act and Income-tax Rules, 1962 (hereinafter the Rules). The relevant Acts, Rules, Forms and Notifications are available at the website of the Income Tax Department-www.incometaxindia.gov.in. Education Cess on income- tax and Secondary and Higher Education Cess on income-tax shall be discontinued. However, a new cess, by the name “Health and Education Cess” shall be levied at the rate of four percent of income tax including surcharge wherever applicable, No marginal relief shall be available in respect of such cess. 10.1 These instructions are not exhaustive and are issued only with a view to guide the employers to understand the various provisions relating to deduction of tax from salaries. Wherever there is any doubt, reference may be made to the provisions of the Income-tax Act, 1961, the Income-tax Rules, 1962, the Finance Act 2018, the relevant circulars / notifications, etc. Calculation of Income Tax in the case of an employee below the age of sixty years having a handicapped dependent (With valid PAN furnished to employer). Calculation of Income Tax in the case of an employee below age of sixty years where medical treatment expenditure was borne by the employer (With valid PAN furnished to employer). Illustrating valuation of perquisite and calculation of tax in the case of an employee below age of sixty years of a private company in Mumbai who was provided accommodation in a flat at concessional rate for ten months and in a hotel for two months ( With valid PAN furnished to employer). Illustrating Valuation of perquisite and calculation of tax in the case of an employee below the age of 60 years of a Private Company posted at Delhi and repaying House Building Loan ( With valid PAN furnished to employer). Compute Mr. A‘s taxable income and tax liability for A.Y. 2017-18. Add : Health & Education Cess @ 4%. 2. One Computation of Taxable Salary and allowances, Deduction for Interest on Housing Loan and Deduction u/s 80C.Mr. X, a Central Govt. Officers in Delhi, is receiving Basic Pay Rs. 40,000, DA at prescribed rates, transport allowances @ Rs.3600+DA thereon, and HRA (existing-from 1st July 2017 @24% of basic pay (though living in his own house). His date of increment is Ist July. The following are other particulars of his income. Compute his taxable income and tax payable, for A.Y.2019 -20. 6 Life Insurance Premium (being a Life Insurance Policy of Rs.1,00,000 taken in name of his wife before 1.04.2012) 10,500.